All of which make it FREAKING hard to make changes to the food! It’s maddening – especially when you are trying to change your lifestyle habits. So what are we supposed to do? Rely on willpower? Eh. That can work but it’s exhausting. Instead…I say we make a plan. And that’s where The Bariatric Foodie Holiday Cooking Club comes in. Cry wolf, and someone will help you! Well guess what? I have created that place. It’s already made. It’s just waiting for YOU to join! And believe me…membership has it’s benefits. Check it out. The Bariatric Foodie Holiday Cooking Club will take place on Facebook, through a secret Facebook group. Secret = not only can folks not see what you say, they can’t even find the group (not even through search) unless they are themselves a member! When you join you’ll be given access to the group, in which you are free to chat with others about your challenges getting through the holidays. This will be your place to air out concerns, ask questions and draw on the experience of other post-ops just like you. But then there will also be support directly related to food. Because…it’s the holidays! We need to make a plan about the food! There will also be fun challenges to help you stay focused on taking care of yourself! Nothing too big or stressful, just a few healthy activities you can participate in that will reinforce the good habits you are building. You’ll also have access to a private chat room where you can come anytime you need to talk to someone! You can join the club now, but official club activities will begin on November 14. You can join anytime, but don’t delay – you don’t want to miss any of what this Club has to offer! As I said above, the club will reference recipes from The Bariatric Foodie Holiday Survival Guide. Now…you may just want the book. I get that. I mean, maybe clubs aren’t your thing (although this one is going to be SO much fun!). If you’d like to just get a copy of the book, it is available on Amazon, and you can get it by clicking here! But I’m hope, hope, hoping you’ll want to get the book and join the club. If so, read on! 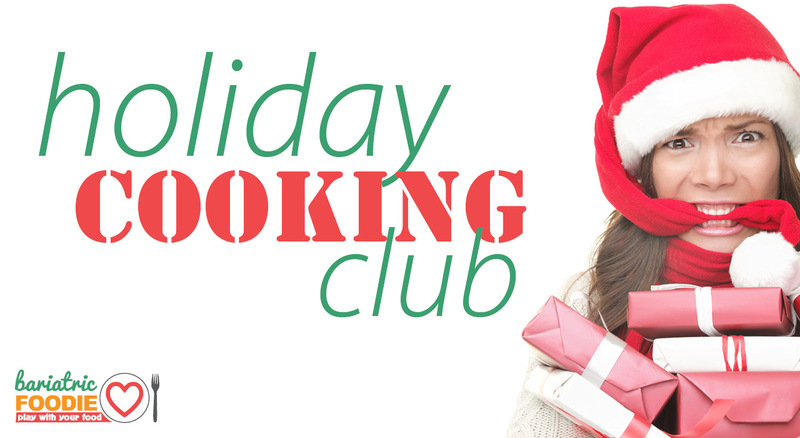 There are two options for joining the Bariatric Foodie Holiday Cooking Club. I highly suggest that if you don’t have a copy of The Bariatric Foodie Holiday Survival Guide that you choose the option that includes the book. It will be heavily referenced! Give yourself the gift of a little extra support this holiday season – join the club!